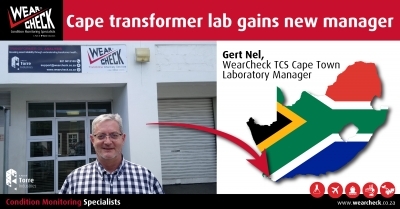 Gert Nel has been appointed branch manager of WearCheck’s transformer oil laboratory in Cape Town. Prior to this, Gert spent 12 years working as a diagnostician at the company’s Speciality Laboratory in Johannesburg. Here, he focused on transformer oil diagnosis. WearCheck promotes transformer health through the regular assessment of insulating fluid and diagnosis of the results via three specialised transformer laboratories in Johannesburg, Durban and Cape Town. As transformers are extremely critical apparatus for providing reliable energy, it is essential to manage the risk of component failure. Gert is delighted to exchange the Joburg cityscape with panoramic views of Table Mountain from the WearCheck Cape Town transformer lab, which is situated at Unit 6, Prosperity Park, 10 Computer Road, Montague Gardens.